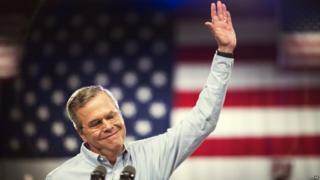 Former Florida Governor Jeb Bush has officially launched his US presidential campaign, promising to "run with heart" and "take nothing and no one for granted". Mr Bush, the son and brother of two former presidents, spoke in his hometown of Miami, Florida. Recently released campaign branding leaves behind his surname, which some see as a political liability. Polling suggests he has yet to dominate a wide field of Republican candidates. Speaking in both English and Spanish, Mr Bush used his speech to appeal to a broad swath of the US electorate - of which minorities have become increasingly more important - not just the Republican's conservative base. "In any language," Mr Bush said, "my message will be an optimistic one because I am certain that we can make the decades just ahead in America the greatest time ever to be alive in this world." Much of Mr Bush's remarks were dedicated to his record as the former governor of Florida, during which time the state enjoyed economic growth. However, his speech was interrupted by at least one heckler, forcing Mr Bush to improvise a response that included a denunciation of President Barack Obama's immigration reforms. Mr Bush also offered some insight into his foreign policy stances. "We keep dependable friends in this world by being dependable ourselves. I will rebuild our vital friendships and that starts by standing with the brave democratic state of Israel," he told the crowd, which erupted in cheers. He also denounced Mr Obama's recent overtures toward Cuba. "Ninety miles to our south there's a talk of a state visit by our outgoing president," Mr Bush said. "We don't need a glorified tourist to go to Havana in support of a failed Cuba. We need an American president to go to Havana in solidarity with a free Cuban people, and I'm ready to be that president." If the past few months have been faltering, this was a solid performance by Jeb Bush. He drew on his leadership experience as governor of Florida, and what he had got done. He said no one deserved the job of president by right of their resume, party seniority or family, or family narrative. It's nobody's turn he said. Though he clearly hopes it will be his. Just a word on the audience - it was probably in number the same as for Hillary Clinton on Roosevelt Island in New York - but in diversity, very different. Whereas in New York the crowd was largely young, affluent and white, here in Miami Dade it was more diverse - ethnically, in age variation and income. That will please Jeb's staff. Although his campaign became official on Monday, it's been no secret for many months and his team is well on the way to raising a $100m war chest. In a video released ahead of the speech and played at the event before he spoke, Mr Bush pledged to protect the most vulnerable and remove barriers to social mobility. In the video, titled The Greatest Century, he said: "I see a great country on the verge of its greatest century, and I'm ready to lead." During a tour of Europe last week, Mr Bush warned he would not waver from his core beliefs, even if some are unpopular in his party. "I'm not going to change who I am," he said. "I respect people who may not agree with me, but I'm not going to change my views because today someone has a view that's different." In a separate video, called Making A Difference, he champions the rights of women, ethnic minorities and the disabled. "My core beliefs start with the premise that the most vulnerable in our society should be in the front of the line and not the back,'' he says. "What we need is new leadership that takes conservative principles and applies them so that people can rise up." A Spanish language video was also released, demonstrating his strong Hispanic links - his wife Columba is Mexican and he speaks Spanish well. But in recent weeks he has found himself on the defensive over the Iraq War - led by his older brother, President George W Bush - as he stumbled to clarify his position. The issue brought into focus the problems he may face over his famous surname and the baggage that comes with it. He becomes the 11th Republican to declare, with Wisconsin Governor Scott Walker and Florida Senator Marco Rubio among his biggest rivals. On the Democratic side, Hillary Clinton is the clear frontrunner. This raises the possibility in 2016 of another Clinton-Bush race like that of 1992, when Mrs Clinton's husband Bill beat Jeb Bush's father, President George HW Bush.